Linda is excited to be the lead trombonist of the Columbus Jazz Orchestra, and hopes to be a role model for other young women. Linda is a graduate of Morehead State University with a Bachelor’s Degree in Music Education where she studied with Dr. Earle L. Louder and Robert Jorgensen, and while still a student at MSU, Linda was a member of Clark Terry’s All-Girl All-Stars at the Wichita Jazz Festival. Linda has enjoyed a diverse career as a freelance jazz and classical musician and private teacher since 1971, and prior to becoming a member of CJO Linda spent 19 years in the banking industry as a bank officer and Commercial Loan Operations Specialist while continuing to freelance and teach. Since 2003 Linda has been teaching low brass as a member of the private teaching staff at Kettering Fairmont High School and maintains a teaching studio at Hauer Music in Centerville. Linda served as Low Brass Specialist for Hadly Watts Middle School in Centerville for eight years. Being the lead trombonist for Swing 76/Swing Era Dance Orchestra led to a long affiliation with the Frank Neville Orchestras, and eventual playing opportunities with Ernie Krivda’s Fat Tuesday Big Band, Phil Giordano Jazz Orchestra, Harry James Orchestra, Guy Lombardo Orchestra, and Jake and Elwood to name a few, as well as working six nights a week as a trombonist and vocalist, and doubling on flute, trumpet, and arranging for the band. 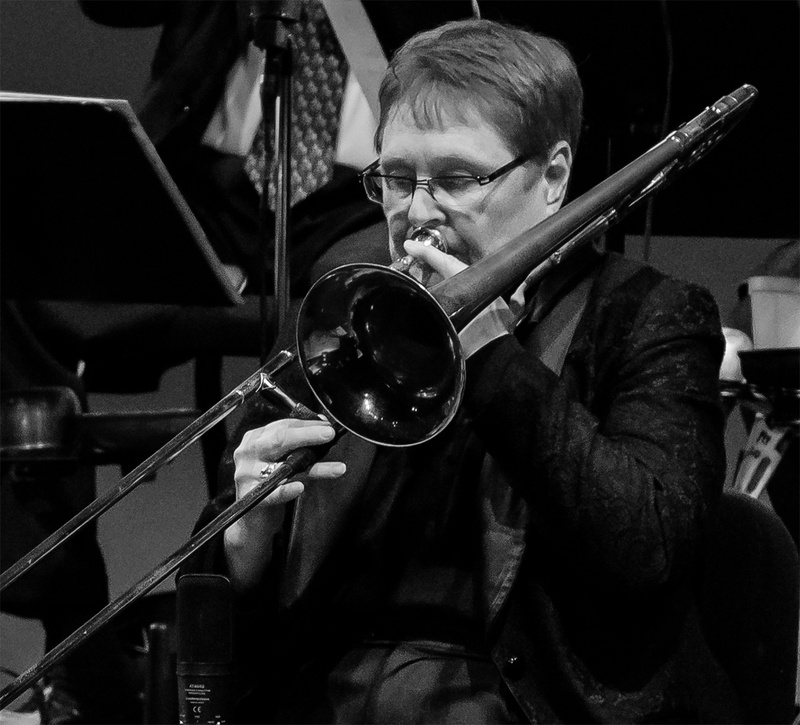 In 1993, the Dayton Jazz Orchestra was formed and Linda was their original lead trombonist. Eventually Linda was asked to join Vaughn Wiester’s Famous Jazz Orchestra as lead trombonist, as well as the New Remnants Dance Orchestra. Since 2001, Linda has enjoyed performing internationally with Sherrie Maricle and the DIVA Jazz Orchestra. Linda was trombonist and conductor for Piqua Players Community Theater for over 20 years. In addition to her position in the CJO, Linda is the Musical Director of the Jazz Central Big Band in Dayton, is a sub with the Columbus Symphony, is a member of the Columbus and Dayton Broadway Series Orchestras, and has been principal trombonist and a featured soloist of the Piqua Civic Band since 1974. Linda has also appeared as an adjudicator, guest artist, and clinician. Among her many well-received clinics are “Telling Your Story Through Jazz Improvisation” at Summer Bones 2006, and a trombone clinic for the DIVA Jazz Orchestra at the Purdue University Jazz Festival 2016. Linda was also excited to be one of CJO’s featured members in Columbus Monthly’s December 2014 All Jazz Issue, to be interviewed by James Moore for Bugles Media in a series of featured articles on professional female brass artists in 2015, and appeared as a featured alum in Morehead State University’s alumni publication “Statement” in 2014. In addition to working with the many amazing guest artists who have appeared with CJO, Linda has been very fortunate to share the stage with Johnny Mathis, Frank Sinatra, Jr., Al Vizzutti, Diana Ross, Diane Reeves, Leslie Gore, Van Dells, David Benoit, the Temptations, Manhattan Transfer, Maurice Hines, Maria Schneider, Yes, and scores of others. In addition to the CJO’s The Colors of Jazz and Come Together, Linda has recorded with Pam Noah, Rob McPherson, New Remnants Dance Orchestra, the Sinclair Wind Symphony, Famous Jazz Orchestra, and as a vocalist with Swing Era Dance Orchestra. In 2008, to honor Linda’s 35 years of service, the Piqua Civic Band released a CD of her live solo performances entitled Linda Landis, Trombone Artist Extraordinaire. Aside from music, Linda helps her mother run the family farm, and enjoys sunny days, her many kitties, fun with friends, fishing, biking, good books, great music, watching old movies, and trying to master Finale and the art of doubling on bass trombone.